The Indian bridal braid, also known as the tikka, is a piece of gold or silver jewelry worn over the center part of the hair. A pendant that hangs from the braid is centered over the forehead where the sixth chakra, the central point of concentration, is located. It serves as a protection against evil and bad luck. The bridal braid represents the unity of two souls in the marriage ceremony. Anchored in the bride’s hair, the tikka can be very elaborate and may have chains that connect it to the earrings or other pieces of jewelry. The pendant usually contains a gem, and pearls and other gems may be used to adorn the braid itself. Depending on the cultural traditions of the region, the tikka may be worn with or without a veil. The bridal braid is part of Hindu religious beliefs and those who practice other religions may choose different hair ornamentation. 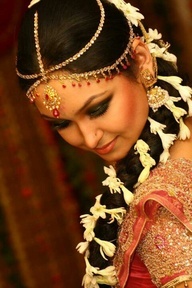 Hairstyles chosen by traditional Indian brides are usually simple to accommodate the elaborate jewelry worn on the head which may include combs or barrettes as well as the tikka. Often the styles are a top knot, a bun at the nape of the neck or a bun worn on the side of the head over the ear. In the southern regions of the country, braided hairstyles are favored. Veils are not usually worn by brides in these areas and the hair style is more easily viewed. The Indian bridal braid is not necessarily made of braided metal. It is usually flexible to allow it to follow the shape of the head and to make it easier to anchor the jewelry in the hair. It may be formed of links joining gems set in metal, in much the same way that bracelets or necklaces are constructed. The design of the pieces varies in the different regions of the country. Hindu brides born in Western countries may not be aware of the symbolism of the jewelry worn by brides in India. In addition to representing the personal wealth or dowry that the bride brings into the marriage, each piece of traditional jewelry has its own cultural meaning. The tikka is one of the most important symbolic pieces of jewelry worn by Hindu brides. The Indian bridal braid draws attention to the bride’s face and enhances her beauty on her special day and, like the veils worn by Westerners, announces that she is a bride.